are saturated / impregnated with phenolic resin and processed under high heat and pressure to form a composite panel. The resultant lab grade panel provides a chemical and abrasion resistant property required for harsh conditions in wet laboratories of science labs, water treatment plants (WWT), research facilities, etc. Produced in North America at a Wilson Art ISO Certified facility with Chemsurf technology, Resistop solid phenolic is also rated as a “anti-static protective material” by the American Society for Testing and Materials (ASTM D257-78) and is primarily suitable for laboratory work surfaces, fume hood decks, Fume hood liner panels, pegboards (drying racks), reagent racks, commercial countertops, cabinet drawer fronts, locker drawers, shelving, window sills, toilet partitions, and decorative casework components. Resistop panels are a uniform low-sheen matte textured finished surface, extremely hard and durable and resistant to scratches and abrasion, while providing exceptional chemical and stain resistance with the flexibility and design advantage attributed to Thick, Solid Phenolic Cores. Greenguard-certified low-emission surfacing makes for a healthier environment in any setting: commercial, residential, hospitality or healthcare, K-12 schools for furniture products. Resistop solid phenolic can be used as a surface on Greenguard-certified office or school furniture to obtain a LEED-CI credit for Low Emitting Office Furniture (Leadership in Energy and Environmental Design Rating System for Commercial Interiors). With a choice of over 200 solid, granite like and patterned color or wood grain colors, designing Laboratory Countertops, shelving, and other diverse applications, has never been easier for architects, consultants or in-house personnel. RESISTOP brand chemical resistant, solid compact laminates are manufactured for application to interior horizontal and vertical surfaces where a superior wear and chemical resistant surface is required. In addition to providing resistance to chemical spills, it provides excellent resistance to scuff and abrasion. 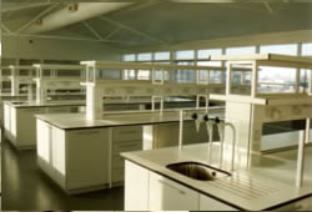 Specific applications may include laboratory bench tops, laboratory furniture as fascia panels, hospital or health facility countertops, and photographic processing work areas. Resistop laminates are certified to ISO 9002 since 1995 and has recently upgraded to ISO 9001:2000 in 2003 and are certified to the most stringent international testing standards. Moisture resistant and will not support growth of common bacteria or fungus, see below. Staphylococcus aureus, Streptococci faecalis, Escherichia coli and Klebsiella pneumoniae. View Resistop Specifications: Click Here.